Design for the Mind: Seven Psychological Principles of Persuasive Design teaches web designers and developers how to create sites and applications that appeal to our innate natural responses as humans. 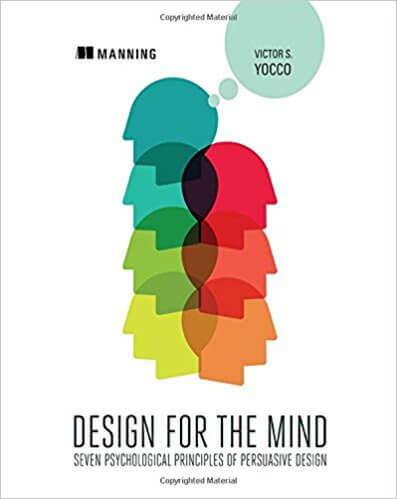 Author Victor Yocco, a researcher on psychology and communication, introduces the most immediately relevant and applicable psychological concepts, breaks down each theory into easily-digested principles, then shows how they can be used to inform better design. Designers and design team members need to think about more than just aesthetics. How do you handle short attention spans. How does your design encourage users to engage, browse, or buy? Fortunately, there are psychological principles that you can use in your design to anticipate and benefit from how humans think, behave, and react. Design for the Mind: Seven Psychological Principles of Persuasive Design teaches you to recognize how websites and applications can benefit from an awareness of our innate, natural responses as humans, and to apply the same principles to your own designs. This approachable book introduces the psychological principles, deconstructs each into easily digestible concepts, and then shows how you can apply them. The idea is to deepen your understanding of why people react in the ways they do. After reading the book, you'll be ready to make your work more psychologically friendly, engaging, and persuasive.